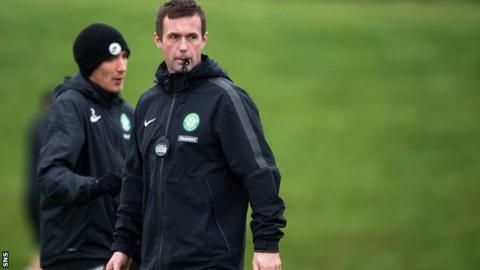 Celtic manager Ronny Deila is more concerned with keeping his best players than adding to his squad in the January transfer window. Virgil van Dijk and Kris Commons are among the players to have been attracting attention from other clubs. Deila said: "To keep [players] is more important as consistency is everything - if you lose your best players you have to start all over again. "To keep is my first priority, then we try to get players in." The Norwegian is, however, hoping to add to his ranks next month but admitted securing the right players in January can be tough. "You never know what's going to happen, but what we know is we don't have to sell anyone and that's a good feeling for me and for the club," Deila added. "We want to keep our best players and that's what we're going to do, then we'll see what happens. "If we can get the players we want on 1 January we will get them in then. It's going to be hard to get it arranged so quickly. The January window is more difficult than the summer as well, because the players you often want are playing and their teams are fighting to reach their goals, so it's harder to get them out. "We have good processes going on and we want to be a better team on 1 February than we are now. We are looking at specific positions and specific targets but I will keep them to myself." Deila became Celtic boss in the summer and despite his side's 2-1 defeat at Dundee United on Sunday, they are four points clear of the Tannadice outfit and Aberdeen at the top of the Premiership. The weekend result ended an eight game winning run in the league, and Celtic remain in the Europa League, the Scottish Cup and the League Cup. Deila, however, reckons his squad still has some way to go, and awarded them a mark of "five or six" out of 10 for their season so far. "We have a long way to go but it's quite good also," he added. "This club is a sleeping bear. It's a huge club with so many talented players and good staff, we just have to have the energy to work and progress, want to learn and want to get better. If you have that you can reach your goals. "I see so many possibilities. This is just on the way to something. When I see the possession we have, the pressure we have, the way we are controlling games, it's about turning the possession into goal chances." With Dundee United and Aberdeen chasing Celtic, Deila insisted his team are very much in a battle for the Premiership title. When asked if the teams below can mount a challenge to the champions, Deila added: "Of Course, it's going to be a tough season. Dundee United is a good team, so are Aberdeen and Inverness. They're the teams we're going to fight with for the title."